Disinfectant mats give you an easy, efficient way to disinfect vehicles or boots or administer foot care products to cattle or sheep. Buy disinfectant mats from our online shop with free, next working day delivery. A 4cm thick, high density foam pad in a tough non-slip cover, designed to withstand heavy loads. A unique waterproof sleeve to hold in the liquid. The sleeve is removable to allow thorough cleaning, which is not possible when the sleeve is sewn onto the pad. They are used in dairies, fish farms, poultry sheds, food factories, horticulture units, vet practices, at agricultural events (including the Dairy Event) and farm open days. 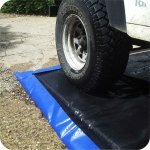 Our mats were used extensively during the foot and mouth crises in 2001 and 2007 by several big dairy companies, the National Trust, major race courses, DEFRA and even a film set! More recently they have been providing protection against avian flu and strangles. We use these mats for biosecurity on our Alpaca Farm. I've used one constantly for nine years, washing it out regularly, and it is still as good as new. The smaller mats were ideal for our open farm day - they retained the disinfectant well and only needed topping up a couple of times during the day. 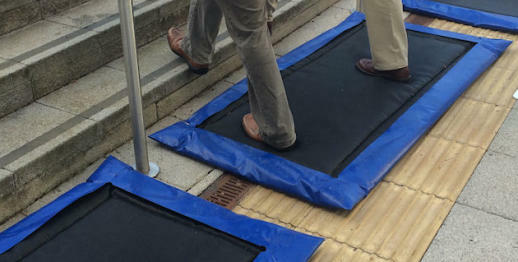 They were easy to use and clean afterwards and we hope to get lots of use from these mats as they appear to be well made. Emma Hendy, Farm Open Day Organiser.